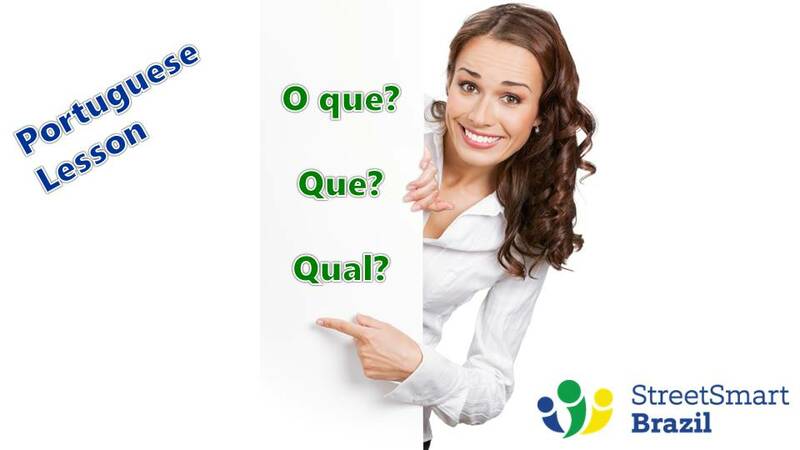 In this Portuguese lesson you will learn how to use 3 question words in Portuguese: O que, Que, and Qual. They all mean what, but are not usually interchangeable. Portuguese language textbooks don’t really explain when to use – and not to use – these question words in Portuguese. Obviously it’s not just a matter of translation that we’re dealing with here. What you need is practical tips. Fret no more. My pro tips will help you use these question words correctly in Brazilian Portuguese. I also have a different lesson about the question words Quem (who), Quando (when), and Como (how). The textbook explanation is that you use o que when you are asking for a definition or an explanation. Pro tip: O que is followed by a pronoun (você, ele, esse) or a verb (ser, acontecer). O que você vai pedir? = What are you going to order? O que ele disse? = What did he say? O que esse homem quer comigo? = What does this man want with me? O que é “zero bala”? = What is “zero bala”? O que aconteceu? = What happened? In Portugal, these four questions would probably just use Que. In Brazil we use O que. O que is never followed by a noun. That’s when we use que instead. Keep reading. The textbook explanation is that you use o que when you are asking for a definition or an explanation (same as above). Pro tip: Que is followed by a noun. Que tipo de música você mais escuta? = What kind of music do you listen to the most? Que livro você está lendo? = What book are you reading? Que comidas eles serviram na festa? = What foods did they serve at the party? Que cidades você já visitou no Brasil? = What cities have you visited in Brazil? Que barulho é esse? = What is this noise? The textbook explanation is that you use qual to ask what when the answer is not a definition or an explanation. Here’s how I think about qual: The answer is usually one of many options in a list of possibilities. It’s as if you are asking: “Out of all the possibilities of …, which one is it?” This sounds a bit awkward, but it will help you understand when to use qual. With practice, it will get into auto-pilot mode and you won’t have to think about it anymore. Let me clarify with examples. Notice that in the examples qual is followed by the verb ser. The verb could be omitted from these questions. Qual é o seu telefone? = What is your phone (number)? Qual é o seu endereço? = What is your address? Qual é o seu gênero de filme preferido? = What is your favorite movie genre? Qual é o cargo dele na empresa? = What is his position with the company? When qual means which, it is followed by a noun. You can usually use either qual or que with this meaning. Qual carro você comprou? = Which car did you buy? Que carro você comprou? = What car did you buy? Qual proposta você vai aceitar? = Which offer will you accept? Que proposta você vai aceitar? = What offer will you accept? You need the plural when the noun that follows qual is in its plural form. Quais livros você leu recentemente? = Which books have you read recently? Que livros você leu recentemente? = What books have you read recently? Quais restaurantes você recomenda em Salvador? = Which restaurants do you recommend in Salvador? Que restaurantes você recomenda em Salvador? = What restaurants do you recommend in Salvador? To speak Portuguese with confidence you need to practice with real people in real conversations. Book a Trial Lesson with us today! Very, very helpful. You are very good at explaining the language. Excellent even!!! Thank you! You helped clear up a lot! I am just still confused on the word “que” by itself. I have also seen it mean something close to the word “that” in English and then sometimes I have no idea how it’s being used (like a preposition). Would love some help on that! It is used like “that” or “who”. O livro que recomendo = the book that I recommend. A pessoa que conheci = The person who I met. Thank you so much again!!! I learned a lot!